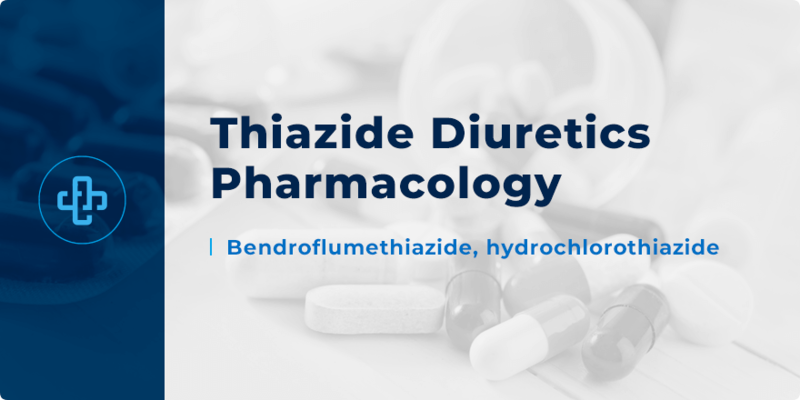 Thiazide Diuretics Pharmacology | All the Facts in One Place! Diuretics are medicines that promote diuresis, or water loss. By promoting water loss, diuretics help to reduce hypertension, and, by extension, the risk of serious cardiovascular events associated with that state. Thiazides (and thiazide-like) are just one class of diuretics. There are other – such as loop diuretics – which act at the nephron, but at a different site. Here, though, we focus exclusively on thiazide diuretics – their mechanism, side effects and drug interactions. Hypertension – a potential first-line agent in cases where other medicines, such as calcium channel blockers, would otherwise be used. Thiazide diuretics may also be used alongside a calcium channel blocker plus an ACE inhibitor or ARB in treating hypertension. How do thiazide diuretics work though? How do these drugs interact with the nephron to reduce water loss? Thiazide diuretics reduce hypertension by blocking the sodium-chloride transporter – Na+-Cl– transporter. By blocking this transporter, thiazide diuretics inhibit reabsorption of sodium and chloride ions from the distal convoluted tubule – with water following by osmosis. As more water is eliminated from the body, the heart works less to pump blood around the body – lowering the required blood pressure to achieve its target. Initially, the body counteracts the antihypertensive effects of thiazide diuretics by activating the renin-angiotensin system. Through their vasodilatory effects, thiazides can exert long-term antihypertensive action. Thiazide diuretics are associated with their own range of potential side effects. Hypercalcemia – thiazides increase calcium reabsorption from distal tubule. Because of hypokalemia, it predisposes the patient to cardiac arrhythmias. Thiazides can also increase serum glucose concentration, LDL cholesterol and triglycerides. Orthostatic hypotension – an effect augmented if the patient concurrently takes alcohol. The side effect profile of thiazide diuretics informs many of the clinical considerations we need to take into account. That thiazide diuretics should be avoided in patients with electrolyte imbalances – particularly hypokalemia and hyponatremia. That thiazide diuretics reduce uric acid excretion, increasing the risk of gout. That caution should be taken prescribing drugs that also cause hypokalemia – potentiating the risk with thiazides. That because thiazide diuretics increase serum glucose concentration (particularly with chronic use), they can worsen or unmask type 2 diabetes. That diuretics are preferred to be taken in the morning, to reduce the risk and sleep disturbance effects of nocturia. That thiazides are frequently combined with ACE inhibitors or angiotensin-receptor blockers (ARBs), for several reasons. First, thiazides activate the renin-angiotensin system, whereas ACE inhibitors and ARBs block it. Second, thiazides cause hypokalemia, whereas ACE inhibitors and ARBs cause hyperkalemia. Because both drugs have different antihypertensive targets – it means combination products can, then, powerfully reduce blood pressure while eliminating the risk of hypokalemia or hyperkalemia. Thiazide diuretics remain an indispensable part of the clinician’s toolkit. These drugs can effectively reduce hypertension – not only for first-line use but also as an add-on medicine to enhance the antihypertensive effects of other medicines. Want to learn more about thiazide diuretics pharmacology? Register with PharmaFactz today to receive instant access to all the great resources you need. In the meantime, take a few seconds to join our pharmacy blog newsletter (above) to receive all the latest facts direct to your email!